This Saturday, the third and last Qualifying Heats of the SKUSA SuperNationals XXII have given the drivers’ their very last chance to improve or build upon their previous performances heading for the “SuperSunday”. As yesterday’s curtain unfolded, it’s time to rewind and know who starts where for the final ten sprints of the weekend in Las Vegas to follow live here. Starting from pole position, Marijn Kremers confirmed his potential by winning the third heat in the pinnacle of gearbox classes for this year’s SKUSA SuperNationals. The Dutchman defeated once again his fiercest rival in the name of Paolo De Conto (+0.120 second on the line). Germany’s Maximilian Paul secured his second top-3 finish in front of the first Heat’s winner Noah Milell and Mathias Ramirez. Looking at the “Master Merge for Main” combining the three Qualifying Heats’ results, Kremers will be starting on pole position in the Final with Milell alongside him. Ramirez and Paul will compose the second row followed by Kyle Wick and Leonardo Lorandi. Despite two P2-finishes, triple-event winner De Conto will have to pull his socks up from P14 on the grid due to an early retirement in Heat 1. Further back, F1 legend Rubens Barrichello will start from the middle of the grid in 17th position. As on Friday, Cedrik Lupien made the best of his pole position to win his final heat (A-B) in front of his brother Samuel to set another family 1-2. Ben Cooper took the third spot with a bit more than two-tenths of a second advantage on Brandon Jarsocrak in fourth ahead of Christian Brooks. Barbados’ Zane Maloney saw the flag in sixth place with Pedro Hiltbrand two positions further back. The C-D heat that followed enabled Jacob Gulick to add his name to the winning-list by defeating Lorenzo Travisanutto for 0.371 seconds. Joshua Car finished again on the podium with Zachary Claman taking P4 and the Brazilian Guilherme Peixoto P5. As stated in the rulebook of the event, a “Last Chance Qualifiers” race was to take place at the end of the day, allowing – in this category – eight more names to access the 34-driver final grid for the “SuperSunday”. Billy Musgrave won the race with the seven other lucky ones being Tahlon Yockel, Miklas Born, Hannah Greenemeier, Nick Persing, Jorge Pescador, Alejandro Jaramillo and AJ Meyers. For this Sunday’s Final, Cedrik Lupien inherited pole position with Travisanutto by his side, followed by Brooks, Lupien and Cooper. Hiltbrand and Maloney will be sharing the fifth row of the grid (P9 and P10). After scoring a P3 and a win on Friday, Jak Crawford kept his momentum going on Saturday by adding one more success to his tally in the A vs. B last Qualifying Heat. Kas Haverkort made it to the second place in front of John Burke, Luca Mars and Tymoteusz Kucharczyk. The C-D race saw Colombia’s Sebastian Montoya claim the win ahead of Diego Contecha and Jeremy Fairbairn with Cole Morgan and Kyffin Simpson finishing in fifth and sixth positions respectively. Reece Gold got the upper hand in LCQ race, accompanied on the way to the final grid by Adrian Cruz, Aidan Fox, Ian Aguilera, Jorge Garciarce and Tagosam Salazar. Jak Crawford will start at the forefront with Luca Mars in P2, John Burke in P3, Connor Zilisch, P4, and Kas Haverkort, P5. Italy’s Gabriele Mini’ will be alongside him in P6 with other potential clients for the win in the likes of Montoya, P7, Kucharczyk, P9, and Cole Morgan, P10. Last-minute recovered in the X30 Senior class (read above), Billy Musgrave found himself in a better place in the Pro Shifter class of which he won the Heat n°3 ahead of Jérémy Iglesias, AJ Myers, Kyle Wick and Jason Pettit. With two heats under his belt, the defending champion Musgrave will be a strong pole-sitter with Myers in P2, Wick and Pettit following on the second row in front of Matt Hamilton. Handicapped by an early retirement on Friday, Iglesias will have some ground to recover from P12. Triple-SKUSA Pro Tour S4 Master winner Jordon Musser finally made it to the win in the third heat of the Master Shifter category. Ryan Kinnear scored second place with Jason Faint in third, Rob Logan in fourth and Nathan Stewart in fifth. But thanks to two victories, Logan will lead the way on Sunday with Musser on the same front row. Faint and Stewart will follow in P3 and P4 while John Crowe will have to deal with Ben Schermerhorn on the third row. Kip Foster has proved to be unbeatable once again in the X30 Master class with a third win in a row in the A vs. B Qualifying Heat in front of Kris Walton, Matt Johnson, Jess Peterson and Danillo Ramalho. Jason Burns imitated him in the C-D race, the second place being taken by Luis Schiavo in front of Derek Wang, Billy Cleavelin and Miguel Mier. It comes then as no big surprise to see Foster on pole for the final race of the weekend joined at the front by Johnson. Cleavelin will start P3 alongside Burns, P4, Peterson and Wang coming in P5 and P6. Despite setting the fastest lap in Qualifying, Colton Ramsey was hit by trouble in the first heat before finishing in the top-3 in the second race. This time, the third and last occasion meant victory in front of Oscar Priest and Dakota Pesek. Steve Barros and Josh Hotz crossed the last heat line in fourth and fifth. With one win plus two top-3 finishes, Pesek was rewarded with the Final’s pole position with Hotz in P2, Priest and Ramsey having to make do with the second row ahead of Foster. James Wharton secured his second win in the last heat, enough for him to earn the Final’s pole position. Dylan Christie concluded his effort in the second place with Kyffin Simpson closing up the top-3 in front of Luca Mars and Bryson Morris. Alongside Wharton, Christie will try to give him a hard time once the lights are out in the Final, as well as Mars and Morris alongside each other on the second row. But let’s not forget about Connor Zilisch and Simpson not far behind in fifth an sixth. He came close on Saturday but this time around, Kai Sorensen was able to win one heat (A-B) by defeating Nikita Johnson and Carson Morgan. Alex Powell and Brandon Carr finished in P5 and P6 while Freddie Slater won as well for the first time this weekend in the C-D race. Diego LaRoque couldn’t do much in second as well as Vinicius Tessaro, Jace Park and Brent Crews, all seconds away from the winner. In the LCQ race, Elliot Cox bought himself one of the last Sunday tickets at stake in front of Danny Dyszelski, Jimmie Lockhart, Michael Costello, Jake Santalucia and Santiago Hernandez. Overall, Kai Sorensen will start from pole in front of Morgan, Johnson, Jeffers, Crews and Slater. Following a second place and a win on Friday, SKUSA Pro Tour winner Max Garcia didn’t miss the chance to make it double in the third and last heat to secure the pole position for the Final. Ben Maier finished not far behind in second with Ethan Ayars coming in third, Cameron Brinkman in fourth and Ivanna Richard completing the top-5. Alongside Garcia as pole-sitter, Ayars will start in P2 with Maier, Urwin and Brinkman P3, P4 and P5. Friday’s pole-sitter in the class, Tristan Young, will be on the fourth row in the seventh position. 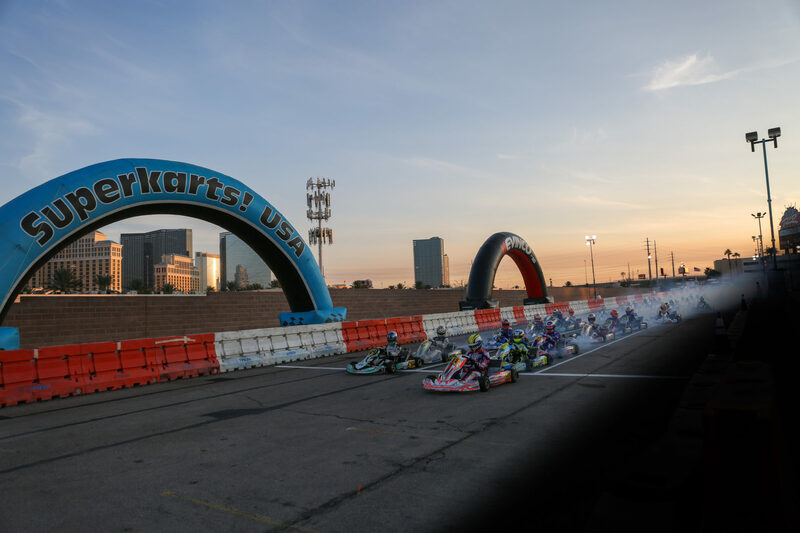 Click here to find the full Qualifying Heats results and here to follow the final races of the SKUSA SuperNationals XXII live this Sunday from Las Vegas!